The Kiowa call themselves “Ka’igwu,” meaning “Principle People.” Originally migrating south from what is now western Montana into Colorado’s Rocky Mountains in the 17th and 18th centuries, they settled on the Northern Plains. But by the mid-18th century the Kiowas and Plains Apache people acquired horses and began a southeastern migration. From 1775 – 1805, they encountered the Lakota and Cheyenne near the Black Hills. 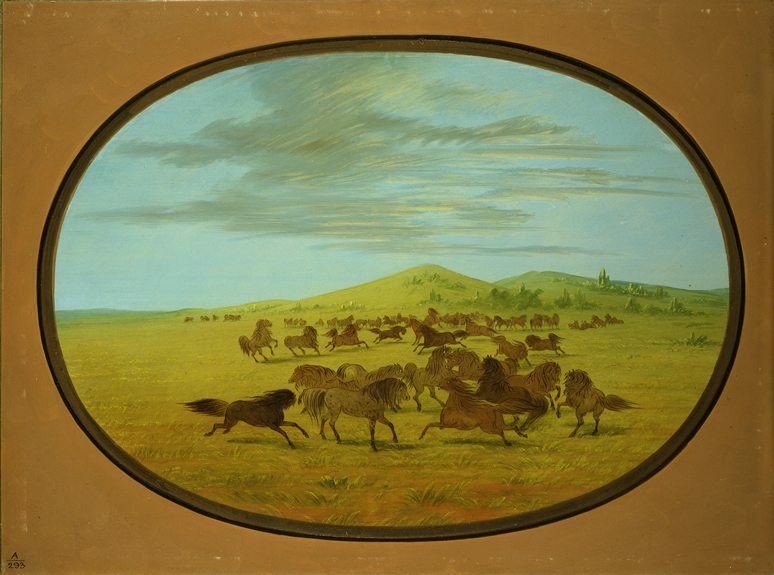 They were being pushed farther south onto the Southern Plains where horses where more abundant. Before the introduction of the horse, dogs dragged the travois with all provisions and belongings on their frequent camp movements. After the horse came into use, as with all Plains tribes, the Kiowa’s economics and lifestyle were revolutionized. They arrived on the Southern Plains as a fully mounted warrior nation. 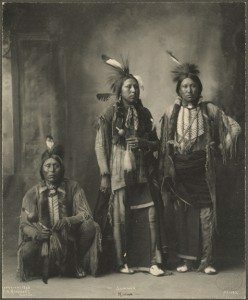 In the Kiowa kinship structure of the 19th century—similar to the Hawaiian family system—relatives were distinguished by gender and generation, making all cousins classified as “brothers” and “sisters.” The extended family groups, called kindreds, were led by the oldest of a group of brothers. This was the centerpiece of Kiowa society and was further subdivided through a class system based on the most prominent families. Prior to 1875, there were 10 – 20 kindreds that made up the larger hunting bands. Each band was led by the most respected brother. The Sun Dance—the ceremony that spiritually and socially united the people—was held each June. In Kiowa cosmology, the power of a common force permeates the universe and is present in all natural entities. The most powerful spirit forces are the Sun, Moon, Stars, Buffalo, and Air. 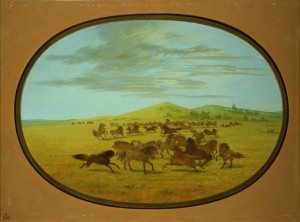 The Kiowa followed the buffalo, their main food source, supplemented by pronghorn, deer, wild berries and fruit, turkeys, and the trading of crops with other tribes. Kiowa women gained prestige through the achievements of their husbands, sons and fathers or through their own achievements in the arts. Kiowa women tanned and sewed hides and also quilled garments and created decorated housewares. 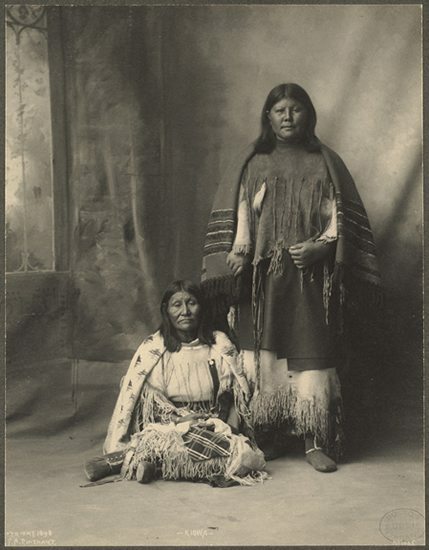 The Kiowa women took care of the camp while the men were away on war parties or hunts, gathering and preparing food for the long winter months to ensure the survival of the group. Intertribal relations on the Southern Plains were unstable until the Kiowas made peace with the Comanches in 1790, the Osage in 1834, and the Cheyenne in 1840. By then the Kiowa had allied themselves with the Comanches and Plains Apaches. They hunted buffalo and moved between the Arkansas and Red rivers. The group combined war parties and moved west into what is now New Mexico, and south into Texas and Mexico where they confronted their Navajo, Utes, Mexican, and Texan enemies. Land holdings of the Kiowa, Apache, and Comanche began to shrink after the 1865 Little Arkansas Treaty, where the Kiowa and Comanche agreed to abandon lands in Kansas and New Mexico. Through the 1867 Medicine Lodge Treaty, the allied tribes relinquished all lands except a tract in southwest Oklahoma near the Wichita Mountains. Following the Red River War of 1874 – 1875, the Kiowas remained on the reservation where the government expected the groups to quickly change from buffalo hunters and raiders to farmers and ranchers. With a few exceptions, these changes did not occur. In 1892 the Cherokee Commission (Jerome Commission) forced the tribes into the allotment process, and on August 6, 1901, the former reservation was opened by lottery for homesteading. The Kiowas bitterly fought the opening of their lands, taking their case all the way to the U.S. Supreme Court where they lost in Lone Wolf v. Hitchcock. They were eventually compelled to accept 160-acres tracts of land. Today, most Kiowa allotments are north of the Wichita Mountains in Caddo and Kiowa counties, Oklahoma. Today, the tribe is federally recognized as the Kiowa Tribe of Oklahoma, has about 12,000 members and is headquartered in Carnegie, Oklahoma. The Kiowa language is still spoken today by about 400 fluent speakers. 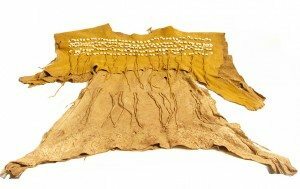 Kiowa is considered part of the Kiowa Tanoan language family which is distantly related to Tiwa, spoken at Taos Pueblo and is the only branch of this language family spoken on the Plains.